Take on the role of a Pokemon Trainer and uncover new tales, and unravel the mystery behind the two forms reminiscent of the Legendary Pokemon. 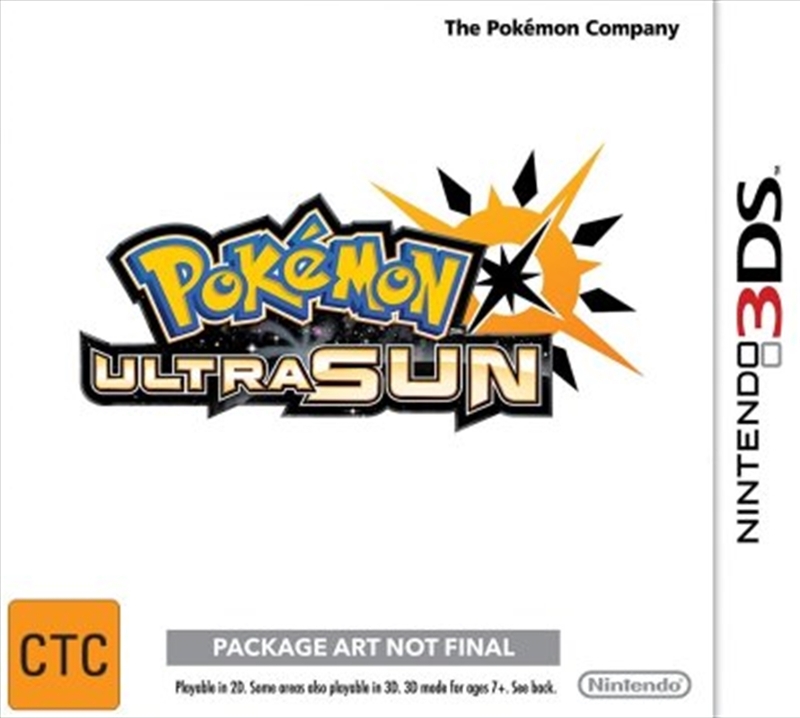 With new story additions and features this earns Pokemon Ultra Sun and Pokemon Ultra Moon the name "Ultra!" Another adventure is about to begin! New Pokemon forms have been discovered in the Alola region in Pokemon Ultra Sun and Pokemon Ultra Moon! These forms are reminiscent of the Legendary Pokemon Solgaleo, Lunala, and Necrozma, first revealed in Pokemon Sun and Pokemon Moon. Head out on an epic journey as you solve the mystery behind these fascinating Pokemon! In this expanded adventure, get ready to explore more of the Alola region, catch more amazing Pokemon, and battle more formidable foes in Pokemon Ultra Sun and Pokemon Ultra Moon! In your adventures in Pokemon Ultra Sun and Pokemon Ultra Moon,you'll grow closer to Rotom the more you communicate with it, and as you do, it will come to help you even more in your journey. Rotom's personality will change based on how you communicate with it. Perhaps the Rotom that joins you on your adventure will come to act a bit like you! Deepen your bonds with Rotom as you travel around the world of Alola! It'll make your adventure more lively and support you on your way! Roto Loto is a feature that lets you get items from your Rotom Dex as you get closer to Rotom. These special items that you get from your Rotom Dex's Roto Loto come in different varieties, with some increasing the Exp. Points or prize money that you receive for a set period of time, while others might make it easier to catch Pokemon or have other effects. You may choose to use these Rotom Powers from your Bag whenever you'd like! If you become close enough with Rotom, it'll use a special power for you called Rotom's Z-Power! This lets you use a second Z-Move in battle, even though you're normally limited to using only one Z-Move per battle! Ride the Waves with Mantine Surf! In Pokemon Ultra Sun and Pokemon Ultra Moon, you'll be able to have fun with Mantine Surf, a sport that lets you do some surfing while riding on Mantine's back. Mantine Surf isn't just a way to get between islands-it's also a sport where you compete for the highest score by pulling off different cool moves! Try to become a top-notch Mantine Surfer by riding Mantine like a pro! Once you get the Ride Pager item, you'll be able to go on Ride Pokemon and reach places you couldn't get to before. As you progress through your adventure, you'll meet and then gain access to various Ride Pokemon. Dash through the world of Alola with the help of Pokemon! Take all sorts of photos with the Pokemon you like at the brand-new Alola Photo Club! You choose the Pokemon to appear together with you in the photo, as well as your outfit, the background, camera angle, and more, so you can take the perfect picture. Get an amazing photo with your favorite Pokemon-and show it off to your friends! After the shoot, you'll be able to decorate your photo with frames and stickers. You'll also be able to show other players the photos you took through communication features. Taking a photo with a Pokemon also makes that Pokemon more affectionate toward you. As their affection toward you increases, your Pokemon will try to do even better than usual during battles. Strengthen your bonds with your Pokemon! In Pokemon Sun and Pokemon Moon, the main character wears a Z-Ring in order to use Z-Moves. In Pokemon Ultra Sun and Pokemon Ultra Moon, the main character will put on a Z-Power Ring, which can use even more varieties of Z-Moves than the Z-Ring! And the games also feature new Z-Moves for certain Pokemon! Z-Moves are moves of tremendous power-so powerful that they can only be used once per battle. When a Trainer and their Pokemon combine the force of their wills, the full strength of their effort bursts forth in an epic Z-Move! All Pokemon can use Z-Moves. To use a Z-Move, you must have two key items: a Z-Power Ring and a Z-Crystal. With the launch of Pokemon Ultra Sun and Pokemon Ultra Moon,TOMY will be releasing their Pokemon Z-Power Ring around the world (sold seperately). If you put on a Z-Power Ring, your battles and adventures in Pokemon Ultra Sun and Pokemon Ultra Moon can become even more fun! The look of the main characters' outfits has changed from the first trip through the Alola region-just in time for them to begin a new adventure! Choose the Pokemon that will become your partner, and set out on a journey through the world of Alola!